Discussion and summary of the results of the annual examinations of the Faculty, 2017-2018 academic years (reporter: G. Avetisyan). Discussion of proposals on reviewing and reforming the faculty charter (reporter: G. Avetisyan). 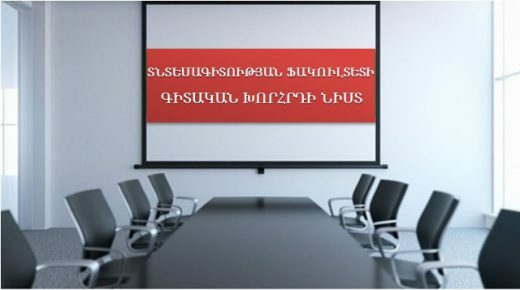 Discussion and approval of the programs, plans and schedules of the internships in the 2018-2019 academic years (reporters: A. Aleksanyan, A. Ulikhanyan). Approval of the distributed list of graduation works for the 2018-2019 academic years (reporter: G. Avetisyan). Discussion on the educational needs of students (reporters: A. Saribekyan, A.Ulikhanyan).